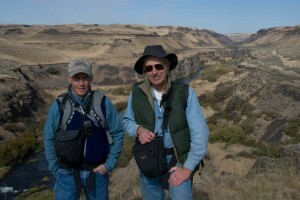 Authors Bruce Bjornstad and Gene Kiver at Palouse Falls in the Channeled Scabland. Geologists and authors Bruce Bjornstad and Gene Kiver will share their knowledge about the Ice Age floods in two interpretive day hikes in the spectacular Grand Coulee area of Washington, Oct. 11-12. Sponsored by the Cheney-Spokane chapter of the Ice Age Floods Institute (IAFI), the hikes will explore East Lenore Coulee and Castle Rock Lake and are limited to 30 participants. The East Lenore hike Oct. 11 meets at 9:30 a.m. in the Lenore Caves parking area. This hike is 4 to 5 miles roundtrip, moderate to difficult, especially across a scree slope up to the notch in the Great Blade that separates East Lenore from the main section of the Lower Grand Coulee. The Castle Rock Lake hike Oct. 12 is about three miles roundtrip with about a 200-foot drop in elevation, mostly along the Castle Lake recessional cataract wall. It’s moderately difficult due to the necessity of descending the cataract wall and climbing on secure iron ladders to Castle Lake and the pothole bench below. The ascent and descent may make the hike seem longer than it is. Hikers will meet at the Dry Falls parking area at 9:30 a.m. and will carpool to the trailhead from there. A Discover Pass is required at both parking areas. The cost for one hike is $20 for IAFI members, $30 for nonmembers, or $10 for teachers and students. The fee for both hikes is $30 for IAFI members, $40 for nonmembers, or $20 for teachers and students. Find registration forms and more information at www.iafi.org or call 509-235-4251. Kiver and Bjornstad co-authored the book “On the Trail of the Ice Age Floods: The Northern Reaches.” Kiver taught geology for more than 32 years at Eastern Washington University, where he met Bjornstad when he was a graduate student there. Bjornstad, a resident of Richland, Wash., is a licensed geologist/hydrogeologist who has studied the Ice Age floods since 1980. Also a licensed geologist, Kiver retired from EWU in 2002 and divides his time between Cheney and Anacortes, Wash., while still conducting research. Both are active members of the Ice Age Floods Institute and regularly lecture and lead field trips on the subject. For more information, contact Keokee Books at 208-263-3573 or look up www.KeokeeBooks.com. Posted by admin. Filed under Keokee News, Slider, Uncategorized.